This problem comes up as soon as you need to reference an Enum value which has not yet been initialized. Often you can avoid this if no circular relationship exists, by declaring the ones with no relations first and then adding related ones below. That is not an option however in the above example. That's because we cannot access the ordinals before the Player Enum has been initialized. While I'm sure there are things you can model with this approach, I would much rather be modelling the states rather than the transitions. There are however an idea that comes to mind from seeing this. The whole idea is to have two Enum's which mirror eachother yet are distinct to the Java compiler - not unlike when aliasing a column in SQL. You have to deal with two Enum's (Player and TransitionTo) at compile time, but at runtime only Player comes into play. It's not a solution I will actually use however, for that it is too complex and not DRY enough. In practice I'll go for the ordinal approach when modeling relations. While there is no code completion to be had and only limited type-safety, it stands out as the cleanest and most elegant solution. It's also relatively easy to add some assertions and unit testing to improve on this a bit. The best would obviously be for Sun to simply fix this in the compiler. The Eclipse compiler have already shown it is possible to do this and make it more lenient. Until then, if you have a more elegant solution to the stated problem, I'd love to hear about it. I'm not sure when exactly or between which versions, but at some point Jasper Report designs moved from being based on legacy DTD to the more modern XSD schema. It turns out that most tools today, i.e. the iReport plugin for NetBeans, are now overwriting the DTD information of legacy designs in favor of XSD information. This can cause problems if and when you are not able to change the Jasper engine itself that fills out the template designs. It also did not seem possible to simply plug-in another XML parser and I found it rather hard in general to find information about this and support forums to turn to. So I sought another solution. net.sf.jasperreports.engine.JRException: org.xml.sax.SAXParseException: Document root element "jasperReport", must match DOCTYPE root "null". The result of doing the above I've placed in LegacyJasperInputStream.java. Probably I am not the only one facing this issue, which is why I chose to write a small entry about it and hopefully helping others. Be advised, you're going to need the slf4j logging facility, or modify the source slightly to make use of the standard java.util.Logger. I think it's only in order to congratulate the USA for what has happened. While oddly 47% of Americans still haven't noticed, the last 8 years of an illiterate republican doctrine "if you're not with us, you're against us" has hurt their country incredibly much. As evident right from the beginning to most of us, Bush will go over in history as the worst president of all time - only elected for his second term I suppose due to that fuzzy term called "American patriotism". Best of luck Obama, you sure have your work cut out for you! 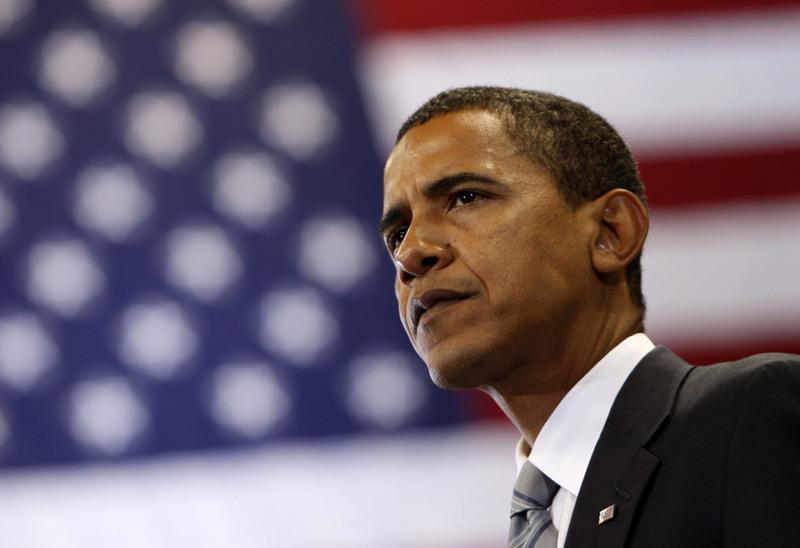 The future just got a lot brighter in the prospect of regaining an America so many of us used to admire once! With a new dawn near and a fresh breeze blowing from the west, let the healing begin. While web applications in browsers are continuing to improve, they still can't quite compete with desktop applications. One of the examples of this is the Novell Groupwise client. Running 64bit Ubuntu poses a bit of a challenge, since Novell only offer prepackaged rpm bundles for 32bit Red Hat and Suse systems. Note, some of this stuff is inspired by Scott's blog entry earlier this year, however I could never get his howto to work for me. There you go. That should give you Groupwise 7.03 running on the latest Ubuntu 8.04. Unfortunately, if you are running Compiz, you are likely to then suffer the notorious gray rectangle syndrome as described in 6429775, 6434227 and 6632124 among others. The good news, the problem appears to be fixed in update 10. Remember the above isn't necessarily the official sanctioned way to do it, but it worked for me. Good luck to you! It has come to my attention that Ubuntu 8.04 updates to the JVM overrides/reverts the modifications above. Keep an eye on this, I noticed it when starting seeing Compiz grey-box frames again in NetBeans. 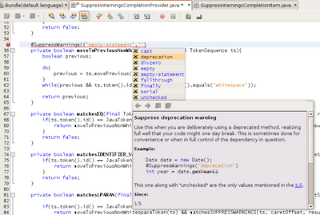 Although NetBeans is capable of suggesting and auto-inserting @SuppressWarnings, it doesn't actually provide code completion or documentation for these values. Indeed, as I've blogged about before, it is tricky to track down the exact enumeration and semantics of these magic values. This is due to the fact that they are entirely dependent on the compiler and IDE. This plugin adds support for the values currently supported by NetBeans 6.1, namely "cast", "deprecation", "divzero", "empty-statement", "empty", "fallthrough", "finally", "serial" and "unchecked". It also tries to explain how and when to use them. This is implemented by a simple recursive descent parser, which looks like this. Should you care to use it for your own parsing of a DSL inside Java String tokens, you can download the complete source code here. There might still be some bugs and perhaps I a missing something, but if you want to give it a spin, you can download the plugin from NetBeans plugin central. The hardest thing was to gather information regarding the valid values, since it differs from compiler to compiler and the various IDE's. If you do happen to find a bug or something incorrect, please let me know so I can correct it. In the post from yesterday I was a little harsh regarding the performance of recent NetBeans versions, which seems to have taken a toll for the worse. One of the most annoying things is how much scanning and processing is going on all the time which harms responsiveness and the overall user experience. The NetBeans mailing list yielded responses like "more features requires more work" which is fair enough. However, I decided I wanted to have my cake (speed) and eat it too (features). It's not exactly new. So called "RAM drives" have been used for ages to speed things up, some Linux distro's even mount the temporary files location into RAM to improve performance. We can do the same to our source checkouts to gain massive increase in throughput as well as access time. There are two easy ways to archive this out of the (Linux) box, mount a dedicated RAM drive or use the TMPFS filesystem. Sorry, Windows users will have to look elsewhere for info about how to set up a RAM drive. Note however that while you can unmount these again, the physical memory it occupied will not be released to the system. Another limitation of this approach is that whether you need it or not, the RAM disk will permanently occupy whatever you allocated to it - no more and no less. So you should probably only use this approach if you need a small RAM drive or you are just testing the technique out. The only benefit of this approach I can think of, is that your mounted partition will be listed and can be monitored from the system monitor. Not only is it easier, it's much more flexible. As you no doubt noticed, we did not actually specify any capacity. TMPFS will use half of your RAM as default. Although you can also specify it directly, there's really no need to since TMPFS is not only able to dynamically decrease but also increase its capacity on demand. This means that if you do not use the partition, you won't pay any memory penalty. Apparently TMPFS is even able to use swap file so that IF you should go overboard in space consumption, you won't suffer loss of data or the like. Now I don't actually want to run into scenarios where my system has to start using virtual memory, so I limited the size of the temporary partition to 1GB, that leaves me with at least 3GB for the OS and applications. It's rather hard to measure and express something as subjective as responsiveness and general feeling of an IDE with and without a RAM drive. Suffices to say it feels like it's running at a blazing speed! Nodes expand at once, tabs activate immediately and it's just an overall impressive experience - it feels like you're back to writing C code rather than Java. Let me try and prove this to you the best I can with just static images. The below screen shots both show the result of running the same simple Ant build target on a small NetBeans module project, first on a normal disk drive and then from of a RAM drive. It took 10 sec to build on my 10.000rpm VelociRaptor disc, the fastest desktop drive available today. An average disc would require around 12-13 sec I suspect. Running from of the RAM drive it took just 1 sec, an amazing 10x faster. It's the kind of thing you have to see in order to believe. I also tried placing NetBeans itself as well as its user directory directly on the RAM drive, but without noticeable difference at run time. It did start up 40-50% faster and became responsive right away, but this is probably not an optimization worth going for. So there you have it. No magic involved, all you need is enough RAM which is dirt cheap* and some consistent working habits. You do have to manually copy your project onto the RAM drive as well as remember to move it to a non-volatile partition before you shut your computer down. However given the fact that we usually always work out of CVS/SVN/HG this should not be much of an issue, in fact you could claim it encourages healthier check-in habits. As a cautionary measure though, I have invested in a cheap UPS in case of power loss and when I shut down my system, a script will automatically copy the content of the RAM drive to a persistent backup partition. For convenience, when I start up, another script will automatically copy the most recent backup back onto to the RAM drive. Thus, rather than having to do a full checkout/clone in the morning, I only have to issue an update. If you really wanted to minimize risks, you could also have a timed cron job or a low-priority synchronization deamon running. Of course, this technique really doesn't have anything to do with NetBeans per se, so any IDE would benefit from it as well as freeform/Ant/Maven projects. If you feel uneasy about working entirely in volatile memory, I suppose it would be possible to simply modify your build scripts such that only the build artifacts are emitted this way, leaving the actual source code intact on a fully journaled non-volatile file system. I had fun setting this up, though I am somewhat surprised of how I/O-bound NetBeans appears to be. In a related exercise with Visual Studio and C# a few years back I did not experience anywhere near this speed-up, possibly because the compiler and tool chain is multi-threaded unlike javac and Ant. So go ahead and give it a try, you might like it too. I obviously take no responsibility for whatever data loss you may experience yada yada. You have been warned! Someone asked me how to put the automatic copy mechanism I mentioned above into effect. We are going to need 2 scripts as well as installing these at the appropriate life cycle hooks of Linux. In the following I assume you have created a directory at /ramdisk_archives with root access permissions only and that you are using a Debian derived distro. Put the below script in a file called ramdisk_to_archive.sh, give it execute rights (chmod +x ramdisk_to_archive.sh) and save it under the /etc/init.d/ directory which is usually where service scripts are put. *You can have 4GB DDR2 for less than US$ 100. Even older consumer motherboards supports 4GB, newer ones 16-32GB. If you care about NetBeans and its performance, an interesting development occurred over the last 24h on the nbusers mailinglist. It seems the upcoming 6.5 release sparked a debate claiming that it's pretty much unusable. While I wouldn't go that far, there is actually some truth to the matter as experienced by my colleagues and I.
I've been back and forth between various IDE's over the years, coming from Visual Studio (VB/C/C#) I've been rather spoiled in regard to syntax highlighting, code completion and debugging. In fact I remember back in 2001 how I was convinced into doing a college project in Java, primarily because of the assistance offered by Visual Studio J++. At that time, no tool provided these kind of features (although Forte and JBuilder tried). In this day and age, things looks quite different of course. SUN finally realized that it's worth having great tools (some would argue they have to solve the problems at the tooling level, since the language has effectively gone stale). In any event, todays Java developers can rely on pretty much the same features as Visual Studio. However, for this there still is a price to pay. Having choices is generally a positive thing. But when it comes to software, having too many choices quickly becomes a burden - less is sometimes more. The problem with having multiple IDE's is that, apart from handling of java source files, they aren't really compatible. They all use each their own build system, supports different layout managers etc. so in reality you can't just switch from one IDE to the other. Given the love for committees in the Java space, I do not understand why a project standard was never established through a JSR. In light of this, it becomes rather important you and your project team settle on one IDE that hopefully satisfies everyone. After initially having used Oracle's JDeveloper for a number of years, we got fed up with the complex stack that Oracle pushed, as well as the semi-yearly releases. We had to live with bugs for a very long time and newer versions of the IDE could never really cope with migrating from the existing code base. We chose NetBeans 5.5 after having had some success with Swing UI work (Matisse) as well as noticing how SUN were pushing for standards as well as de-facto standards such as Ant etc. Swing now also seemed to be better able to deliver a UI experience where you did not curse constantly at the lack of responsiveness or mismatched L&F. The best part of NetBeans is probably how we constantly get new versions (release, beta, milestone or daily) as well as the plugin community around it. However, not everything is rosy. Since SUN decided to focus their attention on a polyglot of languages, performance seems to be hurting. Java and Swing always felt slow and overly complex to me... but that's subject for another blog post. 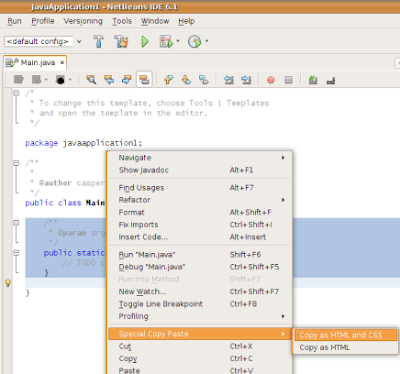 In NetBeans 6.0 it really did get worse though. Often you would experience lag as you were typing, clicking tab or invoking a menu. It may very well only be 200-300ms but it is enough to be perceived as annoying. I believe it was in 6.1 where they introduced massive Action lazy-loading, with the end result that after NetBeans had started, the whole UI was effectively still unusable for 3-5 seconds. Having tried 6.5 beta, I can't say I've experienced the gain in speed the new compile-on-save feature promised. 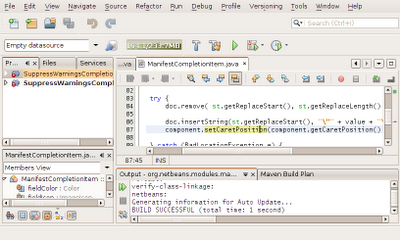 Instead, NetBeans feels* even more busy and hence, less responsive to what I am actually trying having it do. I hope this will be sorted out because otherwise I might be compelled to try and move on to Eclipse or IntelliJ. The former always did run fast and smooth but I never really committed to it fully. The latter I have absolutely no idea about, except I keep hearing it's the best. No not really, apart from documenting the dilemma of choice and warn about the negative developing performance trend of NetBeans. 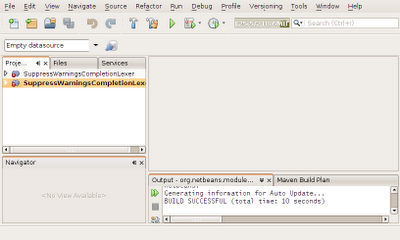 I love NetBeans and the potential I've seen over the last year but productivity comes first. For SUN's sake I hope it will all be resolved, seeing as NetBeans 6.5 is now in beta 2, I doubt it will happen in the 6.5 time frame though. *I should probably note that I by no means rely on slow hardware (Core II 2.66GHz/4GB Ram/10.000rpm HD) nor outdated software (Ubuntu 8.04 64bit with Sun's Java6u10rc JDK). So I have been learning JSF and JPA at work recently. While I can't say those are the most exciting technologies to me, at least they appear to be (or become) de-facto standards and that means more leverage over the long term (something not always the case when dealing with Java technologies). Using JSF with Facelets can be a little challenging, the tools are only so-so and frankly it bugs me to have to type so much type-unsafe stuff in XML, EL and annotations. Anyway, what this blog entry is about is how you can bridge the gab between JSF page rendering and binary content delivery. You can always use an ActionListener or even an accessor on the backing bean if you just want a link to download a PDF, but embedding one inside a frame or iframe is an entirely different matter. I tried many things, most of them felt like fragile hacks. I will now present the best solution in my opinion, it's generic, it's KISS and it solves the problem. <iframe name ="frame" scrolling="auto" align="center"
Tim Boudreau mentions a cool technique the code above could make good use of, by relying on a general key/value parser based on dynamic proxies. The Enum is perfect... well almost. Ok so its time to admit to something. I'm deeply in love with Java's Enum! In my opinion it was the best part of Java 5 and I still wonder why it took Sun 10 years to add this powerful static modeling construct. Although there certainly are known limitations of the Enum, i.e. how you can't extend it, I have never run into a practical limitation myself. Until now that is. The issue I want to raise is that of Enum forward referencing. The great Alan Turing taught us that at the end of the day, everything can be modeled by a Turing Machine and finite automata. We may not often consciously operate at this level, but many things still makes sense to model this way being it a regular expression matcher, navigation rules or similar. 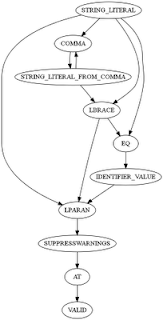 The Java Enum appears to be a perfectly simple, fast and type-safe way of modeling this... or does it? "It is a compile-time error for the constructors, instance initializer blocks, or instance variable initializer expressions of an enum constant e to refer to itself or to an enum constant of the same type that is declared to the right of e"
Granted, it has been some years since my last compiler course but I can't see any reason not to allow forward referencing in this particular case where everything is known. I suspect the culprit simply being that Enum, as with so many other things, was added later using only existing features such as not to change existing initialization rules of the JVM. Time to try to live more up to the name of this blog. As most developers, I have a passion for coffee and coke and consume it in quantities which are probably not on the healthy side. Anyway, when I saw the Keurig Platinum B70 coffee maker in action, I absolutely had to own one. Why? Take a look below.